All transactions are safe and secure with a reliable history in online purchasing behind each of our associates. 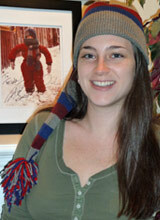 Buy the Christmas Story Hats to own Christmas Story clothing and merchandise. If you're looking for a unique way to express your love for the movie, these replica A Christmas Story hats are an excellent option. It should be noted that the designer studied the orginal hats from the movie in order to create these highly authentic replicas. The selection includes Randy's stocking cap (pictured), Schwartz's stocking hat, Flick's leather aviator cap, Ralphie's snow hat and Randy Parker's scarf replica. Even better, they can also be used as part of A Christmas Story costume. Keep your head warm as you give a nod to the classic holiday movie. In addition to the Christmas Story Hats above, browse the Christmas Story Clothing Gallery for more apparel like men's and women's clothes, kids shirts or hoodies.